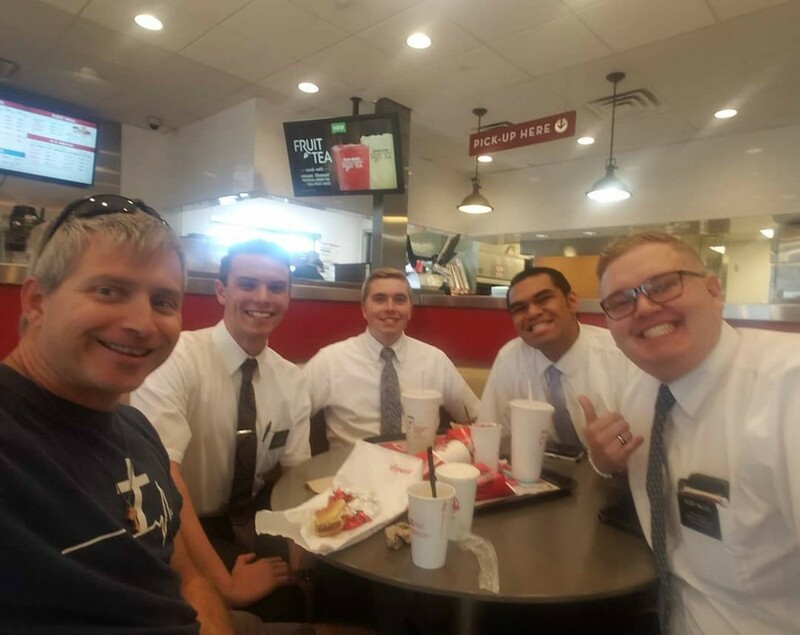 Last month, I saw a group of four LDS missionaries at the local Wendy’s, so I asked if I could join them when I got my food. They said, “Sure,” and made room for me at the table. I found out that two were from Oregon, and two were from Virginia and North Carolina. I began by telling them that I was a Christian missionary, and how I ended up living here in Utah. After that, I asked them how they knew that Mormonism was true. Of course they claimed that they have read the Book of Mormon and prayed about it and God told them it was true with manifestation of the fruit of the Spirit. They weren’t expecting me to tell them that I have done just that, but God told me that it was false, and I have the fruit of the Spirit in my life. However, I deny their god, their prophets, and their church. They then claimed that we basically are both Christians and part of the same Church, so I talked about how different our Jesus is. They didn’t understand how this could be, so I told them that their Jesus didn’t create everything. One said, “We believe Jesus created everything.” So I gave him the example from his own scripture in D&C 93 where it claims that the elements are eternal. If they are really eternal, then Jesus didn’t create them. They couldn’t deny this. 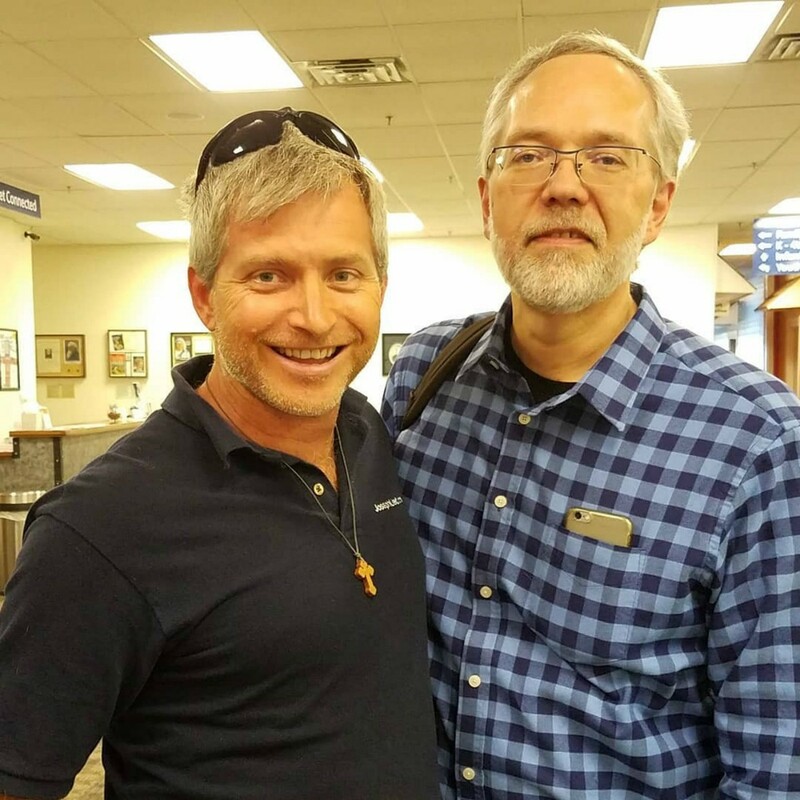 Rob and Dr. HeiserThen I asked, “Given that I know I have eternal life already in the Jesus of the Bible and have my sins forgiven, with nothing separating me from His presence, why in the world would I need the LDS Church?” They didn’t really have a good answer for that. I then told them that their church damned my church. They tried to deny it, but I quoted to them Joseph Smith’s first vision account where supposedly Jesus condemned all other churches. Then they simply said, “Well, God will judge all of us on whether we are doing our best in what has been revealed to us.” And with that, they had to go. I gave them my business card with all my web sites on it. 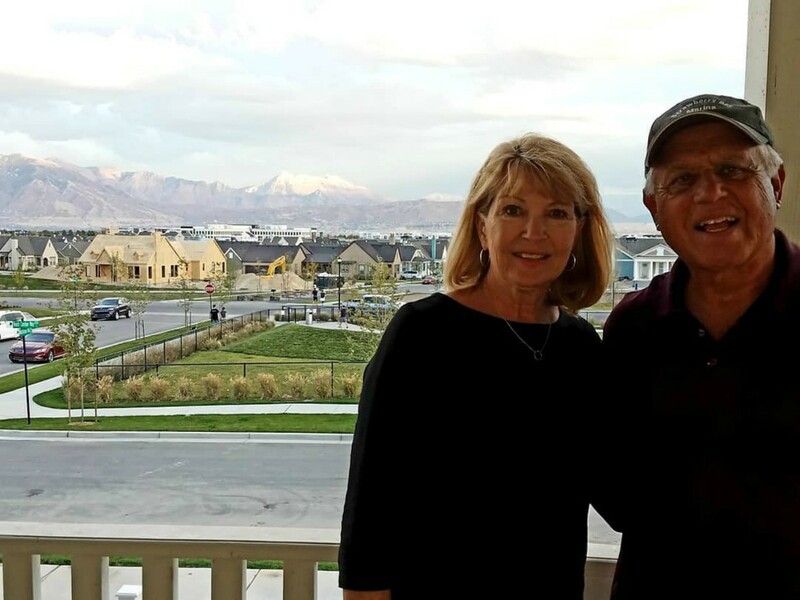 Dr. Heiser was at Calvary Chapel Salt Lake City for a two-day seminar. Mormons often distort his understanding of a divine council in the Bible, so my buddy Dave Snell asked him about it, and I took a good video of Heiser's response which you can watch here. I also was able to fill him in on some basics of Mormon doctrine that he wasn't aware of. Mom and Dad on their front porchcame to our door as a small child. My dad is on the board of our ministry, and he loves to share his faith with everyone, but really loves to do prison ministry. Very thankful that Utah will have more Christian influence with them here. Also thankful that my girls will have grandparents around, and that Tara and I will get more dates! 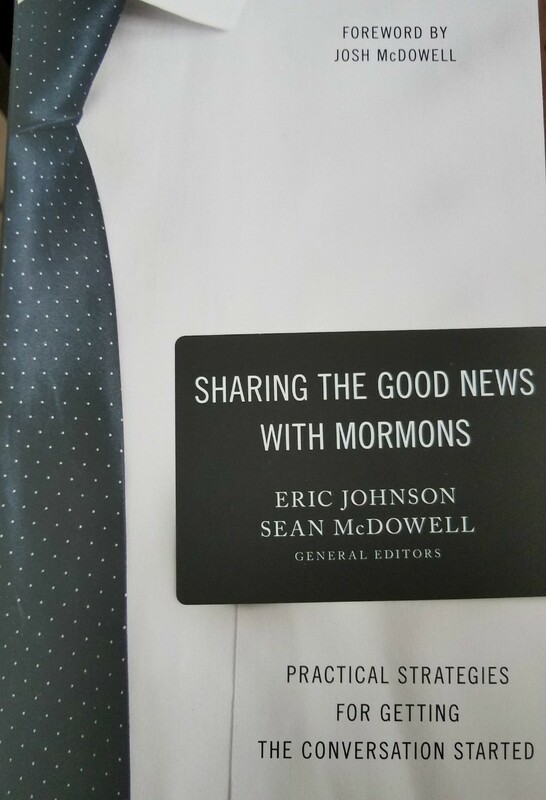 If you sign up to become a monthly partner of our ministry, I will gladly send you a signed copy of our new book Sharing the Good News With Mormons at no cost. If you simply want to buy it, I will sell a signed copy for $18 (includes shipping and handling within the United States). All proceeds go to support CCU, which is a 501c3 non-profit organization. I thank God for your ministry. You have listed in your resources literature by John L. Smith. I met him while I was in Bible School in the years of 1966-1969. He came to our school several times and that was my first exposure to the deception of Mormonism. I was born into a Baptist family. I was saved under the ministry of Baptist preachers, and have remained a Baptist all my life. I am now 74. It has been a habit of mine to follow such leaders as you in the continuing search of better efforts to reach those poor, deluded souls! I have found them to be rather hardened criminals in their distribution of their "feel good", "you can become a god" lies. The are a hard group to deal with. I dare say they are similar to the Jehovah's Witness in their stubbornness. I LOVED hearing your testimonies and experiences at the EMFJ meeting. I wish more people could hear you speak like that. It explains a lot of your ministry and why you do what you do. Thanks for the book .... very interesting the different perspectives in sharing one's faith. You have a sweet family & it's fun to see you grow and what the girls are experiencing. Sending love to all. Was Joseph Smith &/or his father a 33 degree mason? How beautiful are the feet of those who preach the Good News! Great inspiration to me. 🙏 Thanks! I told my wife all about it and she's thrilled that we're supporting such a great ministry and family. Thank you again for coming and sharing with us at Logos! I can't tell you what a wonderful time I had when we met for lunch! I so enjoyed spending time with your sweet family! Looking forward to next time you come to share with us. Can Mormons on their mission have cellphones and be on Facebook? [I replied:] Some. Depends on the mission president. [I replied:] sorry, we all need to struggle against it in all different forms from the enemy. [He replied:] It has seemed the harder I've come against the lds BS and js the more sick I've become. [I replied:] sure, but that shouldn't keep you from following Jesus. He set you free to follow Him. you're still part of the ex-Mo meetup? [I replied:] have you been reading and meditating on His word? [I replied:] I would call a pastor to come once a week and read and pray and offer communion and anoint you with oil for healing. There’s the SUCCESS of your sign approach, the IMITATION of Jesus in confronting error, the alternative methods used (like the wives living GODLY lives, v a “sign approach”) and the NVITATION to others to check out your web page. Notice the rhyme scheme that supports the acronym! Hope it’s useful. I met a woman today that was LDS, and gave her your web site. I really hope she will check it out. Florida has your number!! Hey Rob! While at the Grand Canyon today, my husband and I met a Navajo woman selling jewelry who was telling us how excited she is to be getting baptized. She sounded new to the faith. Then she showed me her Bible App and her Book of Mormon App. I have never encountered this before. My husband did not hear her say anything about the bOok of Mormon App. When we got to the car, we decided to give her our Bible and talk to her. We approached her and told her we had a gift for her. My husband handed her the Bible and told her the only thing we believe is what is in the Bible. That’s the only thing. She looked like it dawned on her that we don’t believe in the Book of Mormon ( and folks were gathering to ask her questions about her jewelry). We linked up with her on Facebook and she said she had needed a smaller Bible to take with her when she sells her jewelry. My husband told her to contact us on Facebook if she had any questions. We live in an area with few Mormons and we really felt unprepared. Can you walk us through how to engage folks in an encounter such as that? We plan on keeping in contact with her. Her face was all lit up with excitement over getting baptized and I just can’t bear the thought of another soul lost. Thank you!! [I replied:] With new converts, its' best to scare them with as much as you can. I'd warn this gal that the BM doesn't have much of Mormonism unique doctrines. The LDS Church gets people to read it and pray about it, get baptized, and then it's easier to introduce the D&C and Pearl of Great Price--the other LDS scriptures. Share with her this video and tell her that you're afraid she's joining a cult that looks like Christianity, but really isn't: https://www.youtube.com/watch?v=-VKT4hrBTuk. I tremendously appreciate your thoughtful response to my discussion prompt on your FB page. One metric I used gauging responses was who mentioned HuffPo. Obviously, opponents of abortion would take issue with HuffPo. But who could reply without mentioning their name? Substantive argument before ad hominem? Your contribution was the gold standard. I’ve made the right choice adding you as a diverse opinion contributing to the eclectic sources helping form, support and defend my views and beliefs. Thank you.